You will hear any time you speak with us, and in what you see on this website - we are passionate about, and focused on, delivering value. 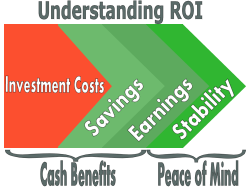 Please visit our interactive ROI calculator to see how our solutions will work for you. Our SureSolutions™ in every case maximize features and security within the bounds of delivering maximum ROI for the needs of small and medium businesses. We are cost conscious in the extreme and are dedicated to the efficiency and scalability of our infrastructure and operations. By leveraging our infrastructure and methodology for our customers we in many cases can entirely remove the need for up front capital expenditures for our customers. Because of this, and because we don't require long term contracts, our SureSolutions™ subscriptions provide the maximum flexibility and lowest total cost of utilization for each and every of the core IT infrastructure services we provide. What's the Value of a DAY OF YOUR BUSINESS? What do you EARN each day your are more productive? Businesses sometimes think of their IT costs as the total dollar value spent on hardware, software and services. However, the hidden cost of lost time and productivity due to technical problems is the single largest expense of business technology today. for better, faster and newer systems than you would pay to manage your own smaller, slower, older systems. With our comprehensive offering of SureSolutions, backed by SureTraining, we guarantee you have the tools you need, when you need them and make sure that you know exactly how to use them.